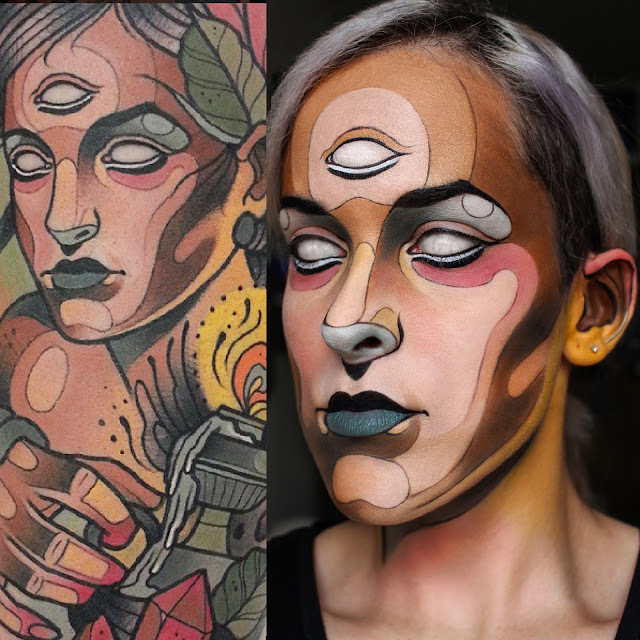 So the month of Halloween (no, not October) is upon us, and while it is my favourite time of the year, I haven't yet started painting my face for the occasion. I've been keeping busy with another makeup-related project that doesn't quite include ugly monsters and scary ghosts. 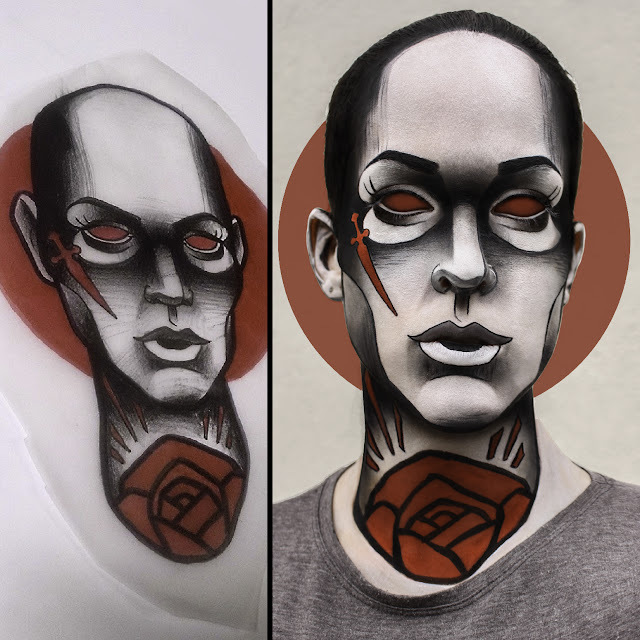 I recently met an awesome tattoo artist who showed me works from various artists and I couldn't help but be inspired. Since I won't be able to get any tattoos any time soon, I decided "Why not become them?" So my little tattoo project began. I hadn't come up with a good name for it, but thanks to Declan Doody, the name "Needles & Brushes" came to be. 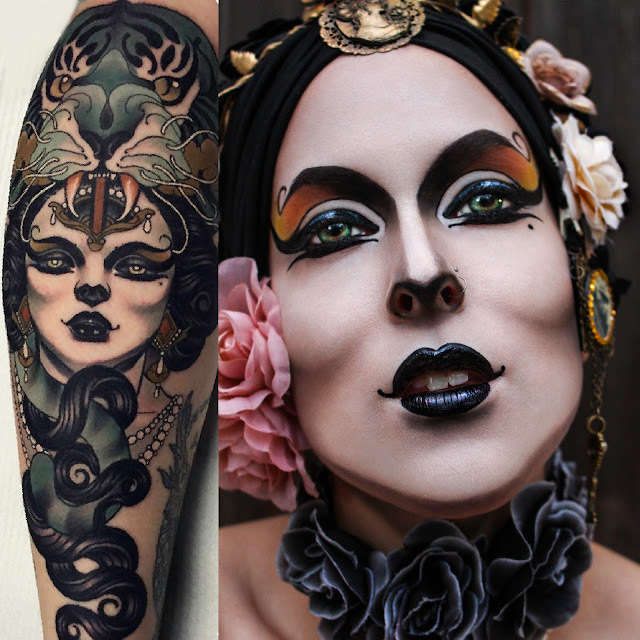 Her work is absolutely mind-blowing and combines everything I love: art nouveau, pretty women, and pearls. Lots of 'em. Her style is elegant and intricate. A must see if you like all things 20's inspired. I didn't have a black wig I could work with, and I didn't want to use my own hair since ALL her women have dark hair. Instead I just hid it all under a turban and added as many flowers and accessories as I could to try to emulate all her intricate decorations. You can follow her work on Facebook, Tumblr, and Instagram. Toni Donaire is an amazing new traditional artist with a very characteristic style. He has a brilliant use of colour and sticks to a limited palette of colours that is instantly recognizable once you know his work. This one was loads of fun to do but so complicated at the same time! I used mainly concealers for this and had to pray for my hand to be light enough to draw on the thin lines dividing the colour! 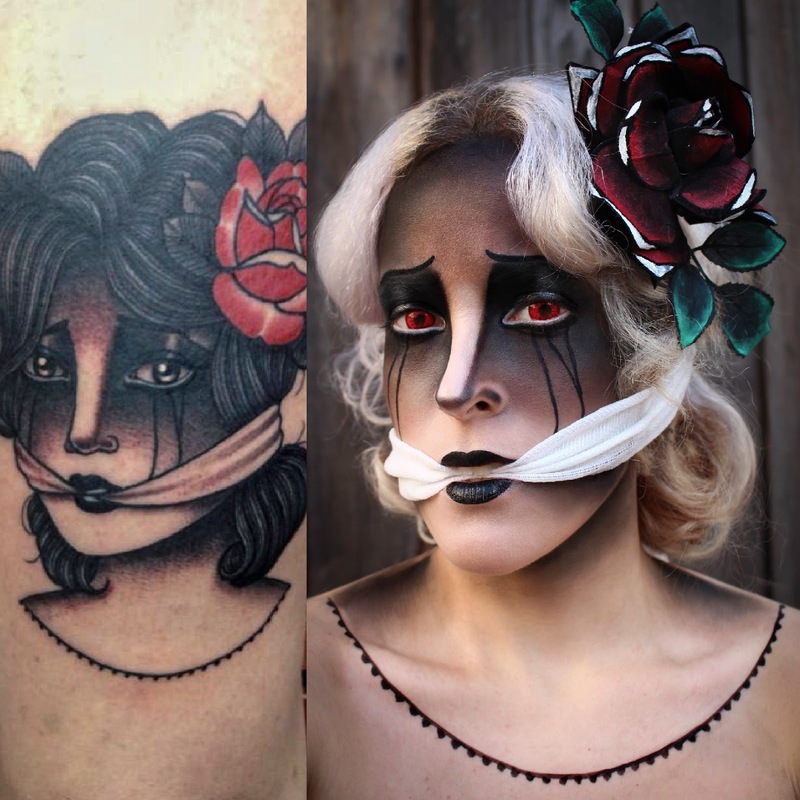 If you're into traditional tattoos, Danielle is definitely one to check out. She does mainly female faces, generally in black and grey with one or two accent colours at the most. Her style is very characteristic and easily recognizable by tattoo collectors far and wide. 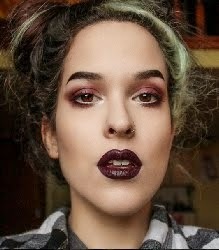 Her work seems like it would be a super simple makeup with just a load of black eyeshadow, but there's more than meets the eye. I used brown to blend out the black and had to shade areas like under the cloth and down my shoulders. Pretty much the man who started it all. He showed me Emily Rose's work and that's how it all began. He's got a good mix of traditional and new traditional work. 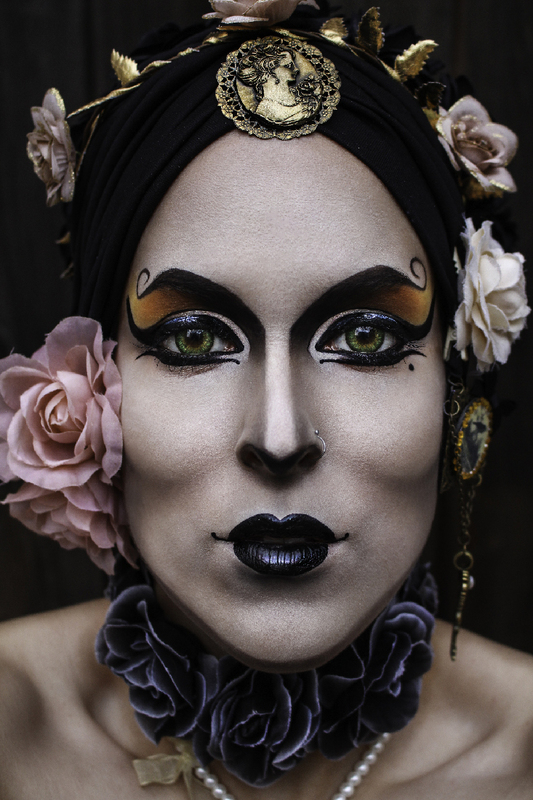 I'm particularly fond of his portraits and faces that are super contrasty with lots of black. Hopefully next year I'll get two portraits off him. I tried to simulate the pencil lines but it was a case of really hit or miss. If I didn't do the lines thin enough, they could completely throw off the entire look, but I risked it anyway and I'm glad I did because it added a bit of texture to the overall look. You can follow his work on Facebook, Instagram, and Tumblr. I hope to keep this as a long ongoing project. Not only does it bring me out of my comfort zone, by making me paint in ways I wouldn't normally, but it's also my own little way of paying tribute to some amazing talent.